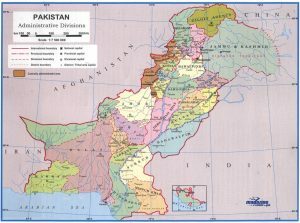 Pakistan is geographically divided in to eight units: Islamabad Capital Territory (ICT), Federally Administered Tribal Areas (FATA), Azad Jammu & Kashmir (AJK), Gilgit Baltistan (GB) or formerly Northern Areas, and four provinces Baluchistan, Khyber PK, Punjab and Sind. The security and safety situation change with the geographical division of the country. The overall security risk in Pakistan is the following. In Pakistan the different INGOs and NGOs and trust/foundations work under the permission of the Government of Pakistan. These humanitarian and development organization face different types of risk for their offices and staff working on different nature of projects. These security risk vary from area and nationality of staff. The risks which involve international staff are different from those facing local staff. The security risk increase on the basis of the type of project and the location, i.e the rehabilitation and contraction of work has less security risk than working on polio campaigns. Geographicaly working on polio in KPk has a high risk of attack compared to working in Punjab province. There are following security and safety risks currently available in Pakistan. The Government of Pakistan has waged a war against terrorism for the last decade and face a lot of terrorist attacks on its civilian areas as well as in different institutes. The terrorist attacks include attacks on public places and transportation, military and police and other law enforcement agencies, offices and profiles. These terrorists also attack different humanitarian organization and humanitarian workers in the country. Beside the terrorist activities, Pakistan is also facing sectarian violence. There are many sectarian extremists which are active in Pakistan and attack different Mosques and Maddarass etc. Kidnapping and abduction is also a big risk in Pakistan, mostly criminal groups kidnap civilian or NGO workers to put pressure on their demands or fund generations to run their agenda. Over the last few months Pakistan is facing political instability. Due to political crises many protests and rallies are observed frequently in the country especially in major cities. These protests have caused road blockage and violence. Street crimes are also observed specially car hi-jacking, robbery at gunpoint, and different types of theft of expensive material. The security measures to minimum risk level depend on the organization activities and location as explained above. The risk level can be monitored with a security assessment of particular areas and identification of different elements. The overall security risks and measures to workers are the same, however due to the different nature of rules and responsibility, risk measurements are different between Expat and Local staff. Proper positive orientation sessions should be arranged with local staff about the nature of the project, the vision and the mission and some part of the strategic organization of a particular country. It will help to communicate staff without side in community, which will give positive impact, motivation to staff and acceptance in community. Orientation session of upcoming challenges on security and risk during working and backup orientation. Local staff should be included in the orientation of upcoming challenges and risk during the implantation of the project. Staff who are positive and willing to work can be recruited. Management should also inform local staff about crisis management. Proper life, accidental and health insurance should be provided to local staff to reduce the liability of the organization in case of major incident and let staff know that the organization is focused on the safety and security of local staff. It will generate a more dedicated work group. For me this is the most important tool. It gives staff peace of mind for themselves and their families should anything go wrong. I personally feel more comfortable working for an organization that has a good insurance policy. Proper arrangement of transportation should be provided for professional assignments to local staff. Use of taxis, public transport etc should be discouraged during working hours for local staff as major incidents take places on public transport. Sunset policy: no travel after sunset as mostly kidnappings and abductions happened at night. Travel monitoring: There should be travel tracking system via calls, sms on a frequent basis. Emergency number excess: all related response and emergency numbers should be provided to staff who must have mobile phones with credit. Proper training should be conducted on security and crises management. i.e. kidnapping policy, car hijacking policy, drivers rules and regulation, watchmen rules and regulations should be cleared and on job training should be given to prepare responses to any incident. A proper information sharing system should be in place in case of any major information or incident, all local staff must be aware of how to communicate on which level. A proper evacuation plan should we written and tested from the project area or office. All staff should be aware of it and have alternative arrangements in case of an evacuation from a particular area or office. Saboor Khan is the administrative Coordinator in Pakistan for MDM.